A dental professional can help you figure out what the cause of your tooth sensitivity is. If it is due to exposed dentin, there are many steps you can take to help reduce the sensitive pain. Use a soft bristled tooth brush. Brush correctly to help prevent abrasion of the enamel and recession of the gums. Use toothpaste formula to help reduce sensitivity. Apply fluoride to strengthen tooth. Prescribe a high fluoride toothpaste and use every day. Place a dental restoration to build areas that have lost enamel. The most important step is to see a dental professional to they can help determine the cause and help find the most adequate solution. 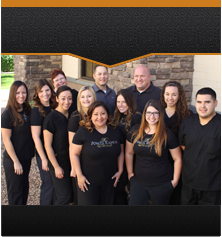 If you are struggling with tooth sensitivity, give Power Ranch Dental a call at (480) 988- 2282.